Service personnel work behind the scenes, often going overlooked and under appreciated for their dedication and fine work. When we take our automobiles in for service, we get to see the service writers, and sometimes the service manager, and the cashier as we make our payment before leaving the dealership. In the world of industrial equipment service, things happen differently. Industrial equipment gets serviced by similar ASE Certified technicians, completing forklift safety training in addition to the manufacturer service training. These well trained technicians travel in dealer provided service vehicles, arriving at customer locations to complete the needed repair. 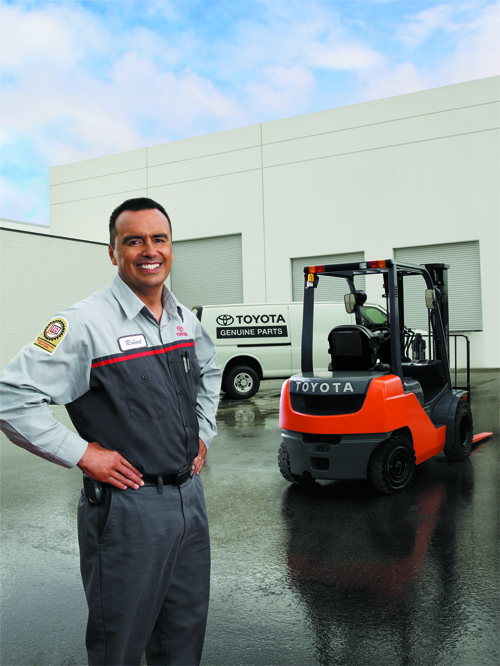 Oftentimes, the forklift driver is the point of contact, and sometimes a manager. Few people see the technician performing work beside the service vehicle, set up, clean up, testing, and getting the equipment back into service. If service work is not completed at the customer site, it is hauled from customer site to the dealership, where ASE Certified technicians go to work completing needed repairs. Our field and shop technicians use computer software to help troubleshoot some of the latest technology. Again, "behind the scenes" service workers getting customers back to work. The forklift technicians are backed by a team of support staff that helps connect the events from start to finish. Our dispatchers use GPS software to optimize response time. Receptionists, dispatchers, transportation staff, parts clerks, service clerks, and managers make sure work is completed timely, professionally, and accurately. We make a large investment in providing exceptional service, striving to exceed expectations. Experience based solutions, not just a slogan here at ACT, it's a way of life. Use the proper device and equipment at the construction site. You need to get the Forklift Training Mississauga before working at the construction site. You should have the proper knowledge of the reaction of chemicals while you are working at the construction site. The respirable crystalline silica training is one of the course you should get while working at the construction site.